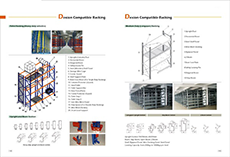 Australia Gondola Shelving is widely used in Australia and New Zealand. 1)Light duty system, safty weight capacity can be 70kg per level shelf. Standard medium duty system, safty weight capacity can be 90kg per level shelf. 2)Pitch 50mm. (different pitchs 32mm, 35mm, 41mm, 55mm are available). 3)Pegboard panel, plain panel, slatwall panel are available. 4. )8″ height baseleg makes easy clean the bottom floor. 5)Quality painted surface with AKZO NOBEL Nontoxic paint powder. colors can be custmized. 6)The whole shelving system are easy to be assembled and disassembled and adjusted. a rubber hammer and leveler will be enough.